This year on Remembrance Day, instead of attending the ceremony held at my work, I sat for a moment of silence at my desk. Dave was in surgery and I didn’t want the phone ringing during the ceremony disturbing others. I always wonder in that moment of silence what people are thinking. 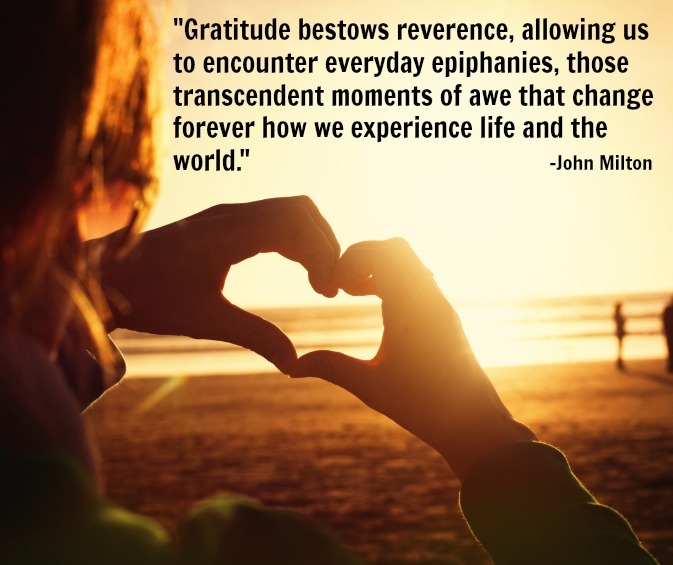 For me, it is always the same thing, an overwhelming feeling of gratitude. This year images swirled in my head like red maple leaves dancing in a brisk November wind. Images of Matthew, lying in a hospital bed after emergency brain surgery this week, of Clare holding the flag at her school’s ceremony at the cenotaph, of Dave lying on the gurney in the operating room, of the aftermath of this week’s U.S. election, of Corporal Nathan Cirillo who lost his life at the same place thousands were congregating to honour the sacrifices those like him have made for our country, of my lake, and of the sun shimmering on the water on my drive in from the hospital to work. There is so much to be grateful for. This week’s #HappyAct is to be grateful every day for the things you hold most precious and dear. Ed. note: Both Matthew and Dave came through their surgeries well–thankfully. Thank you Laurie. A few months ago, I started keeping a ‘gratitude journal,’ and once every week or two, especially during moments I am feeling down, I set to paper everything I am grateful for in my life. It doesn’t take very long before both the page, and my heart, are full.